As Bruno lays out below, this edition showcases some of the most important new research and policy change around the tax transparency and accountability of multinationals. It also reflects another step in UNCTAD’s return to international thought leadership in this area. In the 1970s, UNCTAD was the lead organisation in working to achieve corporate disclosure to support development efforts (an important fore-runner for the proposal for an international accounting standard on country-by-country reporting which we first put forward in the early 2000s, Murphy 2003). Now there is a resurgence, visible from the World Investment Report 2015 which included new estimates of the scale of multinational tax avoidance (of which Bruno was a co-author), to UNCTAD’s establishment of an intergovernmental expert group on Financing for Development, and co-ownership of the Sustainable Development Goal target 16.4, to reduce illicit financial flows – in which the first proposed indicator now under testing would use country-by-country reporting data to construct a measure of profit misalignment. A most welcome development – as is this journal edition. 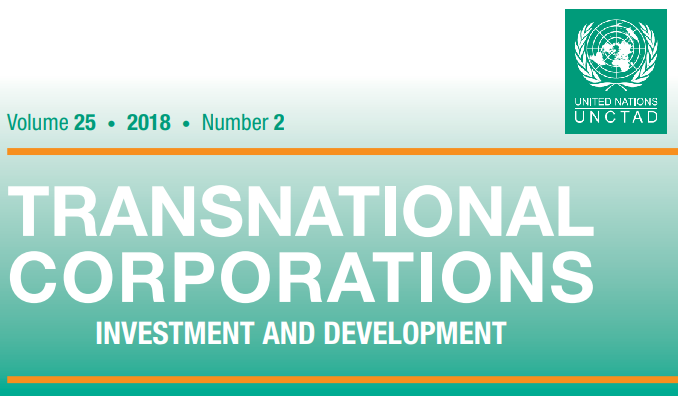 UNCTAD’s Transnational Corporations Journal (TNC) is freshly out with a special edition on International Investment and Taxation. International investment and tax for sustainable development. The Journal seeks to advance academically rigorous research that can feed into policy dialogue on a central research question: how to boost the contribution of international investment and multinational enterprises to sustainable development. In the current trade and investment landscape, characterized by growing challenges to global production, an effective, equitable and stable taxation system for international business is indispensable to prop up this goal. Projects such as the OECD/G20 BEPS framework give direction for clearer cross-border tax law formulation and application. Yet a better understanding is now needed of how international trade, investment and tax policies and instruments interact, point out Jeffrey Owens (guest editor) and James Zhan (editor-in-chief) in their introduction to the special issue. A special issue to enhance dialogue between the investment and tax community. The TNC special issue attempts to do just that. It brings together new insights into the interaction and linkage between international trade, investment, and tax policies and instruments, from some of the major global experts. The issue is divided into two parts (volume 25, issues 2 and 3 of the TNC Journal). This blog explores the themes covered in the first part, which touch on some of the technical aspects in the international debate. The second part (volume 25, issue 3), airing the historical and political aspects of the debate, will be available in time for UNCTAD World Investment Forum (22-26 October). The Forum will include an Academic Conference (on October 26) where the special issue will be background material for a dedicated session to explore the future research agenda on Investment, Tax and Development. Spillovers between tax and investment regulations. Overlaps in the trade, investment and tax realms can be cause for regulatory spillovers. Advance price agreements (APAs) in EU countries is a key example. In the first contribution, Lorraine Eden and William Byrnes discuss the unintended consequences of APAs. Designed to increase tax regulation certainty at the international level, APAs can be viewed –and has indeed been viewed by the European Commission in several recent cases –as hidden, discretionary state-aid policies to attract or retain inward foreign direct investment by offering individual MNEs preferential tax treatment. A number of policy recommendations, including greater transparency and enhanced multilateralism in APA stipulations, can help mitigate these negative spillovers. Taxation in MNEs investment decision. Moving the focus of the analysis to the role of taxation in MNEs investment decisions, Kimberly Clausing examines the determinants of the changing headquarters locations landscape of the largest MNEs over the past 15 years. The paper empirically shows that taxation is not a main driver of MNEs location. This means that strong tax competition policy, prompting a race to the bottom in corporate tax rates and tax revenue collection, is not the most effective policy option when the objective is to attract large MNEs. The analysis sheds light on a key trade-off confronting policymakers: that is, between competitiveness and job creation on the one hand, and protecting the tax base on the other. The paper puts forward a number of reform options to make this trade-off less vexing. Reform options to improve tax certainty and equity in international investment. One reform option is formulary apportionment – that is to divide the MNE tax base among jurisdictions on the basis of an agreed share of sales, employment and assets in order to reduce profit-shifting opportunities – which is discussed by Tommaso Faccio and Valpy Fitzgerald in the third contribution. The authors advocate for transition to formulary apportionment and use Vodafone data (the company is one of very few that reports its operations by country) to simulate the effect of apportionments on the distribution of the tax base. The limited benefits of standard formulary apportionment schemes for poorer countries suggest the inclusion of “per capita income” in the factors used for redistribution of the tax base. The value at stake: the economic impact of BEPS. Any reforms of the international tax system need to build on solid analytical ground and empirical evidence. In their paper, David Bradbury, Tibor Hanappi and Anne Moore of the OECD highlight the methodological challenges and complexity of estimating the BEPS on a global level. The authors provide insight into the herculean data collection and analytical efforts produced in the framework of the G20/BEPS project Action 11 on “Measuring and Monitoring BEPS”. The paper highlights not only the challenges and the achievement of the OECD approach to sizing BEPS, but also provides a thorough review of other existing methodologies, all together contributing to create “a consensus that the global fiscal impact of BEPS is sizeable and that the fiscal and economic benefits of reducing BEPS are likely to be considerable for individual countries”. Pushing the link between international investment and taxation: investment-related profit shifting. One of the first and best known of these methodologies is the FDI-driven approach to estimate the scale and economic impact of BEPS, which was put forward by UNCTAD in its World Investment Report 2015. The approach provides the most in-depth analysis yet of the link between international investment and taxation, making explicit analytical use of this link to estimate the revenue losses generated by BEPS. In the final paper, Richard Bolwijn, Bruno Casella, and Davide Rigo of UNCTAD describe in detail the approach. The paper shows that tax avoidance practices enabled by FDI through offshore hubs are responsible for significant leakage of development financing resources. In policy terms, these findings call for enhanced coordination in international tax and investment policymaking. It is hoped that these papers, together with those to follow in the second part, will contribute to deepen the dialogue between the tax, trade and investment communities at the level of government, business and academia.